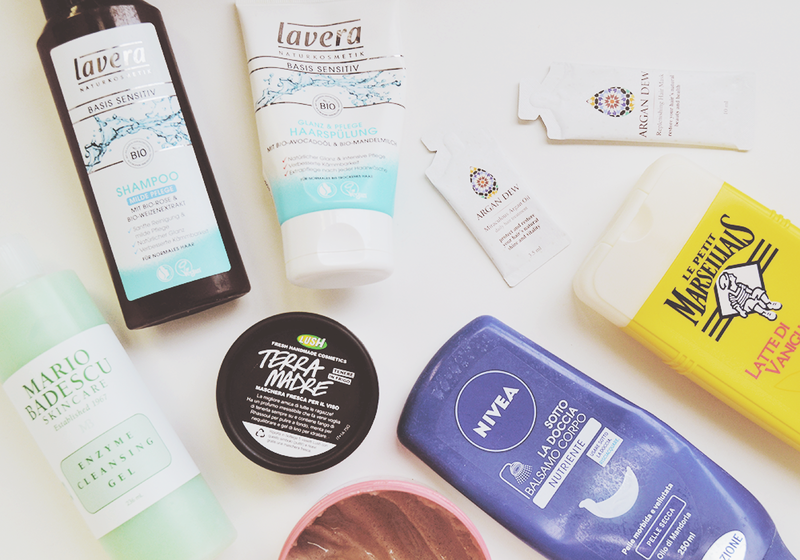 Hair – I wasn’t a Lavera hair products fan at first but since I bought quite the stock at the beginning of the year, I’m inevitably using them on a daily basis in order to finish them. I have to admit I quite like the Basis Sensitive range (especially the scent), in particular the Lavera Basis Sensitive Mild Care Shampoo (£5.45) and the Lavera Basis Sensitive Hair Conditioner (£5.95) which create a great combo together. They have the same subtle almond-y scent, which is absolutely delicious and super relaxing, and whilst the shampoo really goes deep down and gently clean my oily scalp (even though I always feel I need a bit too much product to feel satisfied), the conditioner does a good job in lightly hydrate my hair without weighing it down – however I wouldn’t suggest it if you have hair prone to tangles. Something I’m applying between the two is the Argan Dew Restorative Hair Treatment*, of which I only have some little samples and which I’m only recently testing, but which has already left me pretty satisfied. It’s an Argan oil, Jojoba oil and Shea Butter based hair mask which aims to deeply hydrate, repair, protect and re-energize your hair in only 5 minutes. The scent is subtle but relaxing which makes this mask perfect for any pampering shower. I also apply the Argan Dew Miraculous Oil* on damp hair right after the shower, which should be lovely on dry hair, however having oily hair I’m not sure I’m a fan. Body – As for my body I was all about the & Other Stories body wash however I finished my last one, so at the moment I’m enjoying the super inexpensive Petit Marseillais Gel Douche Lait de Vanille (£3.10) not because it aims to be something particularly good for your skin, but simply because I’m a vanilla lover and I adore the scent which makes every shower so relaxing and nice. I’m a scrubs lover and I just love testing new formulas even though I just the #1 fan of the & Other Stories offerings once again, but I’m enjoying the Soap & Glory Flake Away Body Scrub (£8) which has the classic Soap & Glory scent (nice) and it’s quite good at scrubbing away any dry skin, though I just can’t still say it’s equal to the & Other Stories offerings. When it comes to hydrate my body I’m the lazier girl and I just feel like all those in-shower body conditioner were thought for lazy girls like me. Not that I always remember to apply the Nivea In shower Body Moisturiser Dry (£3.56) but it’s nice to have a quicker in-shower option at your fingertips – this one you just apply it on your body and then rinse it off like a hair conditioner but for your body. I’m quite the fan of the concept and I’m quite keen about trying the Lush offerings but they maybe are a bit too expensive. Face – When in the shower I like to wash and cleanse my face with a gel formula and I find when you’re having a hot shower it’s the best time to deeply clean those pores of yours. I’m loving the Mario Badescu Enzyme Cleansing Gel (£12.31) which containing papaya extracts which are natural AHAs, not only deeply cleanses your skin, but lightly and gently exfoliates it too. It prepares my skin to a good after-shower face mask session, and recently I’m loving the Lush Cupcake Fresh Mask (£6.25) of which I’ve already talked recently here; this is a lovely multi-purposes face mask which is definitely amazing on skins on the oily side, but never leaves my skin dry or itchy, whilst creating a nice matte texture. It also contains some bigger grains which act like a scrub when you remove the mask after the 10 to 15 minutes are passed, making the whole experience even better. My skin always feels oh so soft after this quick but effective routine, it’s just the best Sunday pamper treat for your face. What are you using in your shower recently? I do like that Soap&Glory body scrub in the summer, it’s not too harsh and smells lovely! 🙂 For winter though I like more grainy formulas, like Caudalie’s Divine Body Scrub! I’m glad you talked about the Cupcake Mask from Lush, I was thinking of getting it but my skin is really dry at the moment so I might have to go with something else. Currently, I don’t really have anything noteworthy in my shower except a foot brush. It has a brush and pumice stone on one end and a file and something that looks like a cheese grater on the other. It really prepped my feet for the summer fast and it feels nice to brush my feet in the shower! As much as I love a nice shower, I always find that a bath is nice in the winter. 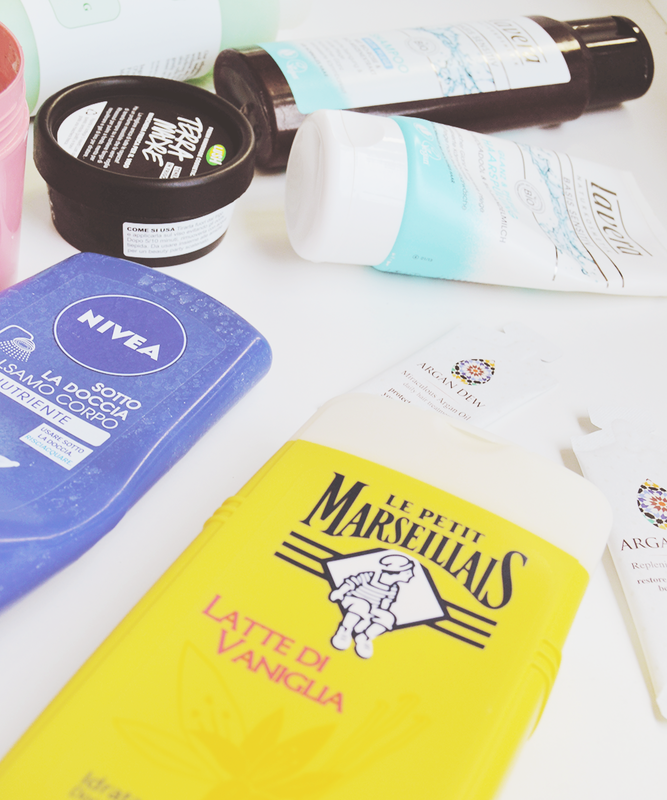 I don’t really use many products in the shower to be honest, except for a nice shower gel!